wall. Here's ABC's Terry Moran. This house will truly be the people's house. 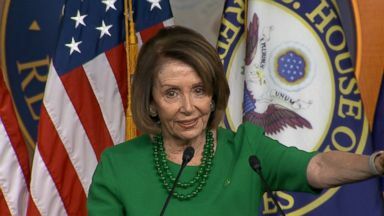 Reporter: One for the history books for the second time Nancy Pelosi elected speaker of the house. Congratulations, madam speaker. Pelosi and the Democrats are now in control of the house of representatives. This shift in power coming after a nearly two-week long government shutdown. Congress and the president in a stalemate over the border wall sending the markets into a nose dive and putting Americans on edge. In a surprise visit to the white house briefing room today, the president congratulated Pelosi. I just want to start off by congratulating Nancy Pelosi on being elected speaker of the house. It's a very, very great achievement. And hopefully we're going to work together. But also insisted on funding for his border wall. I have never had so much support as I have in the last week over my stance for border security. President trump is stubborn as ever. Feels like this is exactly what he was sent to Washington to do and to deliver on this border wall is his number one priority. As for Democrats, they just took the majority. They're not in a mood to compromise or capitulate to president trump. Pelosi helped to lead the Democrats back to power in the house. Her influence seen in that pink wave of women who also took office today. This freshman class in the 116th congress is the most diverse in U.S. History. Among their ranks the first Muslim and native American congresswoman. 36 freshman women were elected bringing the total women in the house to 102. We all have the ability and the privilege to serve with over 100 women members of congress. The largest number in history. 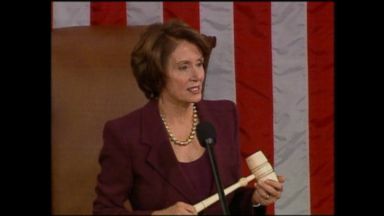 Nancy Pelosi is the first person in nearly 60 years to reclaim the speaker's gavel. After becoming the first female speaker of the house in 2007, and back then I talked with her just before she took up the position. Think of all those girls out there and the young women. How critical is your potential election to inspiring them? I hear from young girls and women and the fathers of young girls all the time saying that my success is an inspiration to them. Nancy Pelosi has been a trail blazer. She recognizes the power that is represented by the diversity. It's something that's beneficial for Democrats, particularly as they face down president trump in this era. Thank you so much. Among today's history maker Abigail spanberger. The first woman to represent Virginia's mostly rural 7th district. It feels amazing to be part of the wave of so many incoming members, particularly women. Tremendous backgrounds and perspectives. I'm excited to see what we can contribute and bring to the house. She's a former CIA agent and flipped her historically Republican district by running as a moderate, a tactic that appealed to many women voters in her district. She didn't waste time trashing her opponent. She was straight up. No foolishness. It was all real. And sorely needed. . Mikey sheyrl also found support among women. We first met her last year at the second women's March where she was campaigning with her daughter running at the antithesis to president trump and his policies. She's got four kids and she coaches their soccer and La crosse teams. She's also a former Navy pilot and federal prosecutor who decided to run, she says, after becoming disenchanted with her district's 22-year Republican incumbent. Serving my country for my entire adult life to be here and have a congressperson who wouldn't meet with his constituents, that offended my sense of democracy. I think she'll stand up to the trump Mcconnell agenda. And stand up she has. She officially requested her congressional pay be withheld until the government shutdown is over tweeting I came here to govern not engage in partisan politics at the expense of hard working Americans. A shutdown. Stretching into day seven. In closer to a resolution. The partial government shutdown is now 13 days in. President trump saying yesterday -- It could be a long time or quickly. It could be a long time. It's too important a subject to walk away from. At issue the president's demand for more than $5 billion for a border wall. The Democrats offer for border security measures, 1 $.3 billion but not a dime for a wall. President tmp, if you wt to open the vernment, you must abandon the wall. Plain and simple. The impact of this standoff is being felt across the country, literally piling up from national parks like Joshua tree in California where campgrounds have been closed to museums shuttered in the nation's capital. Closed. For many of the 800,000 federal employees who have been furloughed or are working without pay, the effects of the shutdown are even more direct and personal. I just want to know what options I have as a furlough worker in the federal government. I'm in good standing with both my banking institution and so I'm look agent how we can negotiate and look at some options stretching some things out. Furloughed nearly two weeks ago now, Daryl Burton is prioritizing the essentials. College money for his son. This is my son, Aaron. We know as responsible parents we make sure we do what is necessary. Burton who has worked in decades says federal workers shouldn't be caught in a political ping-pong match over the wall. If you will. Put us back to work so we can do what we need to do and take care of our families. Pelosi put out new bills but president trump says he will not support them, but it may not be his entire decision. President trump cannot count on united control of Washington to push his agenda forward. We'll be right back with the final thought. 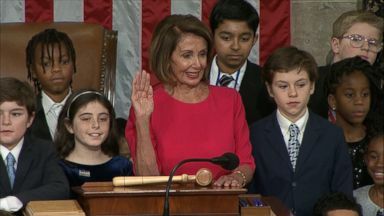 The House of Representatives votes to elect Nancy Pelosi as speaker. Jan. 4, 2007: Pelosi was sworn in as the first female speaker of the House in U.S. history. "The View" co-hosts discussed what role incoming Speaker of the House Nancy Pelosi will have in uniting the Democratic Party as the 116th Congress convenes Thursday. 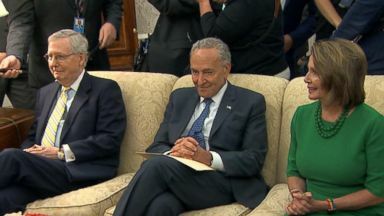 Democratic leaders Nancy Pelosi and Chuck Schumer meet with the president before a crucial government funding deadline. 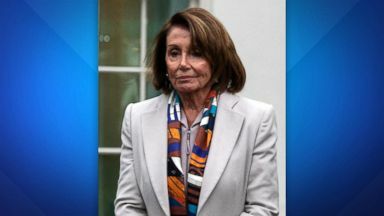 House Minority Leader Nancy Pelosi said she told the president she’s praying for him after Tuesday’s confrontation. 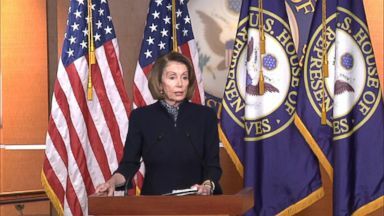 House Speaker-designate Nancy Pelosi says that lawmakers should punt a debate over the president's demand for a border wall to next fall in order to avert a partial government shutdown.